As there are so many older and relatively obscure whiskies on my list of potential reviews for January, I thought I’d begin with a more recognizable name: Glenfiddich. However, this is not, alas, one of their regular releases in the US. It used to be but was pulled a few years ago. It can still be found outside the US and at duty-free stores. It is a vatting of whisky matured in bourbon and sherry casks (in what proportion, I do not know) and is, unusually for Glenfiddich, bottled at the higher strength of 51%. My sample came from Michael K.’s bottle (you can read his review here). Tangentially: does anyone know which distilleries with official releases that were hitherto sans tangible peat have not jumped on the peated whisky train in recent years? Other than Glengoyne, that is. Off the top of my head, I’m pretty sure Macallan haven’t and probably not Glen Grant, Glenrothes or Glenlivet. Continuing with my mini series of reviews of classic single malts here is perhaps the most famous, certainly the most ubiquitous of them all: the Glenfiddich 12. 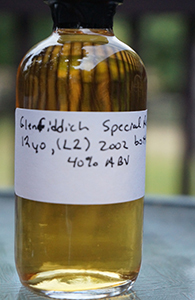 This sample is from a bottle released in 2002 though, and so is probably very like the first ever Glenfiddich 12 I ever had, which as for so many people (whether we like to admit it or not), is probably the first single malt whisky I ever had. I haven’t really had it very many times since then and so am intrigued to go back (in a sense) and see what I make of it now. 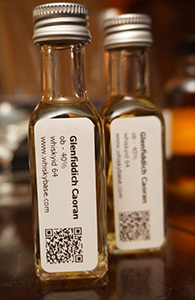 Here is my first review of a malt from the best known of all the Scottish distilleries, Glenfiddich. I have already recorded my thoughts about the low reputation of Glenfiddich (and Glenlivet) among whisky geeks and so will not repeat myself here. 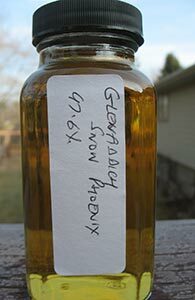 The Snow Phoenix may in fact be their most lauded malt in recent years among said whisky geeks and that’s despite it being a NAS (“No Age Stated”) release.